Due diligence is an investigation of a business in connection with a business transaction or possible transaction. Due diligence is often carried out by someone looking to buy a business or someone investing in a business (buy-side diligence); or by a seller (or its agent) to identify the business’s potential and business’ problems (sell-side diligence) when planning for sale of the business. The seller in a transaction has an advantage in that he or she has more knowledge regarding the business and thus may not feel compelled to make additional inquiries about the daily business operations. 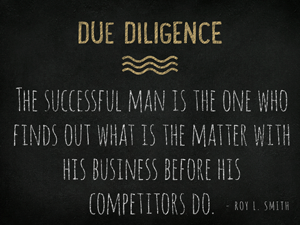 As such, buy-side diligence is more intense and consequential. Due diligence is not solely an endeavor aimed at ascertaining risks associated with a business. Businesses are usually purchased because there is a monetary gain to be made from their acquisition. A buyer that is buying a business that is not doing so well will want to assess the potential and unused capacity in order to discover how to produce synergies and potentialities. This discovery may lead to a buyer being able to outbid rivals or choose not to share the value of synergies. Understanding risks is critical in the purchase of a business, but buyers gain a lot from diligently surveying the potential and capacity for growth and development. Due diligence is an investigation of a business in connection with a transaction or possible transaction. Due diligence is often carried out by someone looking to buy a business or someone investing in a business (buy-side due diligence); or by a seller (or its agent) to identify the potential and problems of the business (sell-side due diligence) when preparing to sell the business. The due diligence process starts at the moment an interest in a purchase of business arises and continues even after an acquisition agreement is negotiated and even signed. Acquisition agreements include schedule attachments that identify certain information about a business that was not previously recognized. Due diligence plays a huge role in the preparation of these schedules and the negotiations between the parties. Even after the deal is signed, buyers will typically perform confirmatory diligence to make sure the representations in the agreement were accurate. Buyers will also conduct post signature due diligence when they are addressing a business’ integration and operational issues and plans.